This was never meant to be a food blog. There was never an intention of filling this space with recipes, or answering queries about why your french onion doesn’t look like the one in the picture. This was meant to be a space of growth, with food used as the medium of interpretation. Food, and feeding, is how I manage to get through this life. It is more than an avenue for me to make a name, or a paycheck, it’s spiritual, tactile, and language to me all at once. This space was meant to share that. 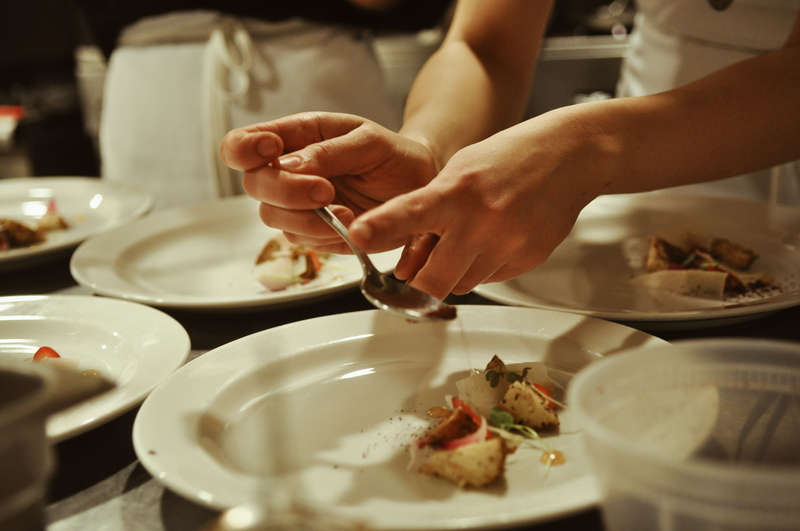 In Whites, is much more than a clever play on words about working in the food industry. Wearing whites (or not, as it more often is in kitchens anymore) means that about ninety percent of life is spent in a hot, tiny, clustered space, preparing food, feeding people, and feeding myself in grander ways through that. Growing and evolving alongside the flames, steel, and occasional pain. Those kitchens are my version of therapy, anger management, higher education, and recess. They are a tangled web of vines, growth itself. Growth is beyond a simple definition of “complex”. Growth is deeply rooted in the concept of forward (and upward) motion, the conscious disregard of comfort, and manic embrace of aches and wounds rubbed raw, smelling of copper mixed with salt. I have never been rooted in those things. Comfort is the creature I feel closest to. There is an undertone of languidness to everything I do, a metaphorical supine body, allowing the worlds tides around it to push, pull, and navigate. Swimming was never an interest. Growth is necessary, but the active pursuit of it has proved a difficult venture to leap into. Ambition has remained a distant acquaintance, fortitude a rarely met friend. To clarify, desire has never been the issue. Coveting what a future holds comes easy to this soul, who revels in what – ifs, maybes, and perhaps. How does one learn to fight? How is ambition reaped like wheat from the fields, to feed that passion called hunger? “Because there was a hunger in me to see everything, and do everything. I wanted to be everyone I saw. I wasn’t enough for me. Can you understand that?” -Sidney Sheldon. When hunger has been present for so long, after a certain point comes a numbness. A trickery of false satiation, the heart, spirit, and mind are fooled into the belief that they’re doing just fine, thank-you very much. Preservation settles in, curled against ignorance, they lie in mind under a blanket of brittle resilience. Hunger isn’t truly experienced until the chance of not being hungry arises. Indulgent and earthy aromas of pure hearts, sincere souls, and honest characters curling and furling around. That is how an appetite is whet, how the feeling of needing sustenance is awakened; and just like teeth cutting through a tender ripeness, when that starvation is fed, you become enlivened. This is what sustenance feels like. Energy, that crackling bolt that surges through restless veins, finding dominion within a needy mind. No more is that lackadaisical float through life enough. Through the foamy waves, an arm is raised in fight, lowered in a stroke. Briny breath sucked deep into the lungs, stinging, and grating, and real. The slightest bit of fare has kindled enough warmth to motivate those sleepy limbs, imagine the effect of a feast. One stroke doesn’t win against the currents, and one meal does not feed for long. Just as knives and fire are tools of old I’ve come to learn from, so are the integrity and kinship of shared passions. The aim of feeding that hunger, to feel the warmth, to be able to fight, is not to win the war of change; change is inevitable. Nor is it even for growth. The universe and those residing in it provide those in spades for you, you just get to determine what you grow into. The fight is to be aware, awake. To not allow the lull of complacency, or the glimmer of comfort, to rock you gently into your late years without having learned the seas in your own way. If my desires to share what food is to me, and can be, with those who don’t know their need of it yet, wasn’t met with minds of genuine encouragement and support, I wouldn’t be writing these words. If my dormant hunger for an opportunity to thrive, but more importantly fail, wasn’t met with a certain stalwart spirit, I wouldn’t be planning bigger and better adventures in this field, the way I currently am. More importantly, as this year begins to wind down, it’s become apparent that the only way to truly nourish oneself beyond the short term, is to give it all away. The opportunities that arrive like saving bread, are only rewarding when torn and shared among others. The hunt for more is only plentiful when experienced with fellow hearts. This is not a food blog, but it is a blog about food.